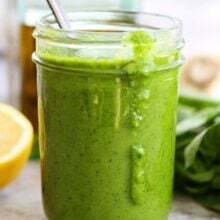 Basil Vinaigrette-this easy basil vinaigrette is great as a salad dressing or sauce for chicken, fish, vegetables, or pasta. It is good on just about everything! Happy 4th of July! 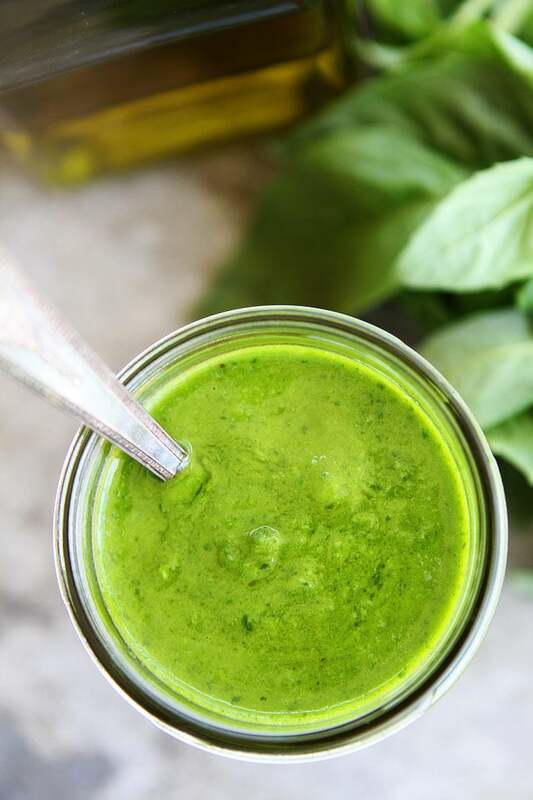 Today, I am sharing one of my favorite summer recipes, Basil Vinaigrette. It takes about five minutes to make and goes great on just about everything. I use it mostly as a salad dressing, but it is also great on vegetables, chicken, fish, and pasta. 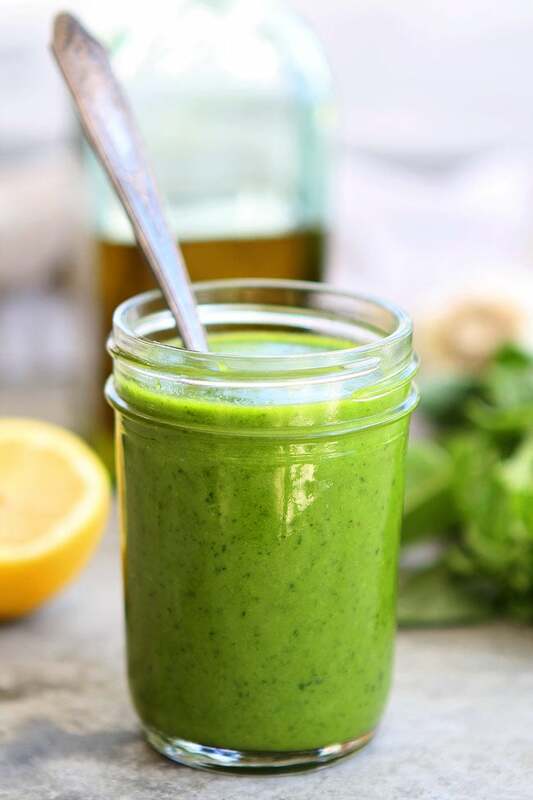 During the summer, I keep this Basil Vinaigrette in the fridge at all times because it seriously makes everything better! 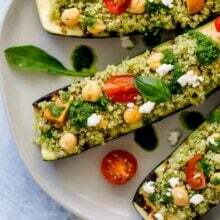 And it is a great way to use up the summer basil! To make the vinaigrette, blend basil, garlic, shallot, fresh lemon juice, vinegar, olive oil, salt and pepper together. 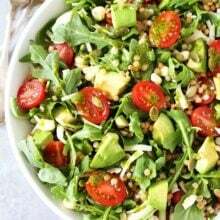 The end result is a bright green vinaigrette that is full of flavor. It will keep in the fridge for up to 5 days and don’t worry if you run out because you can always make more. And I highly recommend you make a caprese salad and drizzle this vinaigrette over the top. It is life changing! 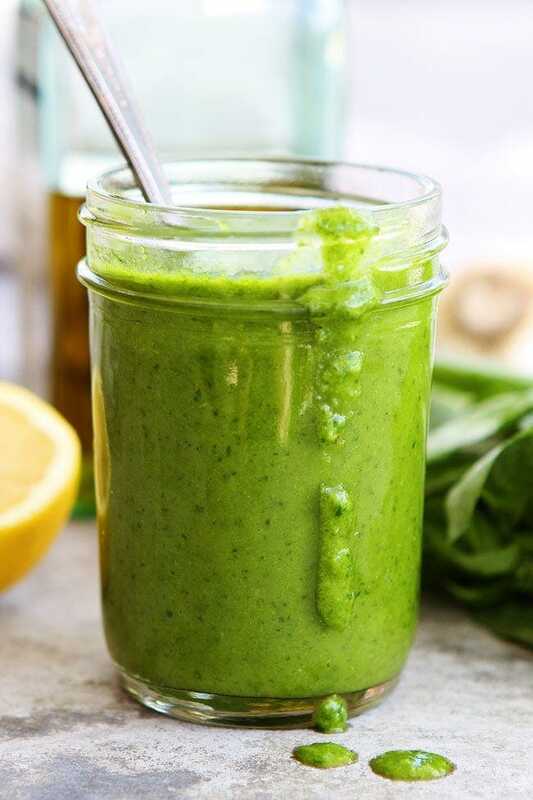 Make this quick and easy Basil Vinaigrette, it is sure to become a staple in your house! I can’t live without it! 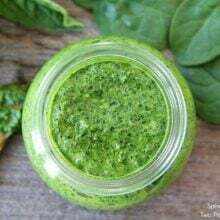 This easy basil vinaigrette is great as a salad dressing or sauce for chicken, fish, vegetables, or pasta. It is great to have on hand! 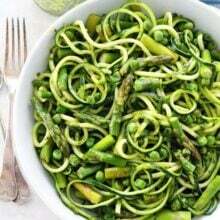 Place the basil, garlic, shallot, lemon juice, vinegar, salt, olive oil, and pepper in a blender or food processor. Blend until smooth. Taste and season with additional salt and pepper, if necessary. Serve! Note-vinaigrette will keep in a jar or container in the fridge for up to 5 days. This may be a weird question but how would this be mixed with canned tuna? I’m trying to find a non-mayo alternative. Seems like the author hasn’t replied to any comments. I would say try a little of the sauce with a little tuna. If you like the taste, go ahead. Definitely a staple in my house! I put this on everything! I can’t wait to try this vinaigrette on my next salad! So pretty too! gah!!! I would want to put this on everything!! I love the vibrant color! It sounds so good! Any recipes for peach or balsamic vinegar salad dressings ? What affordable extra virgin olive oil do you use? I keep striking out at the grocery store and can’t find anything light enough for dressings. Thank you! I only use CALIFORNIA OLIVE RANCH olive oil. This looks tasty, wold you think this would freeze well? So nice and fresh and summery! Like pesto in dressing form…yum! And I love the beautiful color and fresh summery vibe. Thanks! I made a low-FODMAP version of this yesterday (used a combo of garlic oil and EVOO instead of the garlic clove and green scallions instead of shallots) and it was delicious! I love pesto so I knew this would be up my alley. I mixed into a summery salad with potatoes, spring mix, bacon, corn, feta and roasted green peppers, zucchini and some mystery summer squash I picked up at the farmers market. I’m hosting a farm fresh-themed outdoor potluck this week (each dish must include either a homegrown fruit/veggie or something from the farmers market) and I definitely want to come up with a dish with this yummy vinaigrette! This is the most wonderful healthy alternative for a sauce. I make this weekly and put it over everything. I even find myself licking the spoon. Thank you, this and a few of the recipes are staples in my diet! I’ll do it to try it. I need to lose a few pounds. It seems to be quite tasty to drink. I just made this and it is NOT FAIR how good this is. I don’t think I can survive without this in my fridge at all times. I licked the food processor bowl and I’m not even ashamed to admit that. This tastes delicious! I won’t be able to use it all up in time and I want to know if it can be frozen? Has anyone tried that? Can you freeze this dressing? I have a ton of basil growing and would like to have some for the winter. Thanks! Yes, it might discolor a little after being frozen, but still tasty. Can you freeze in ice cube trays ? I made it and it was delicious. Poured it over grilled shrimp. Will continue to make it. It is a staple in our house! Glad you like it too! Pack the leaves in a measuring cup. Just made this dressing! It’s so delicious! Thank you! Have to say…this is the first year we have grown basil and we made this 4 weeks ago…and we have made it every week since! It is SO good! Thank you! We now have a main dish and this dressing on a salad for dinner every night. Thank you! Oh, this is really delicious ! You’re right – it tastes great on everything! Was so tired of pesto and we have sooooo much basil! Just made this today. The basil vinegar vinegarette was absolutely delicious!! !